Shine Your Light In the Middle!! Welcome to my Monday Blog, friends! Thank you all for your visit and a very special welcome to some of our new friends from outside the US – here are just a few: Mexico, Canada, Turkey, Brazil, Georgia, Jersey, Macedonia, Vietnam. Awesome!! What if we all lived by the rule of “getting more by giving more” ? I’m not referring to money either, but rather, acts of kindness towards others…including strangers if the situation calls for it. You know, just to be selfless sometimes when we see someone in pain or need. Can we take the time to be kind to someone in need? Of course this goes back to the idea of “The Golden Rule”: “Do unto others as you would have them do unto you.” For me, this puts it all in the proper perspective, especially when we consider the fact that there simply are no guarantees on this Earth. Oh yep, we’ll say that “there’s life and then there’s death”...true, but the important part is how we live in the “middle” part. What kind of person are we? Do we take more than we give? Are we all about I, I, I or Me, Me, Me? What if we found a way to SHINE OUR LIGHT IN THE MIDDLE part? I believe that we’re all gifted…every single one of us. Let’s think about that and let’s cultivate our gifts…let’s shine our light at every opportunity we have to use them for goodness…and not just for ourselves. KINDNESS: Too often we underestimate the power of a touch, a smile, a kind word, a listening ear, an honest accomplishment, or the smallest act of caring, all of which have the potential to turn a life around. My prayer for us all this week is that we’ll open our hearts and minds and ask God for His favor in leading us to someone for whom we may be a shining light, through an act of kindness. GOD is Good! GOD is Great!!Always!!! This entry was posted in Uncategorized on August 27, 2018 by Author Margaret McBride. Welcome to my Monday Blog, my dear friends! Thank you for visiting me here each week. I truly appreciate you and I encourage you to leave a comment anytime. Yes!! Well, let’s get to it…are you happy or what? Now I’m not talking about being deliriously happy every waking moment of our lives – that’s just not realistic. I’m referring to the kind of happy that’s just there when we open our eyes every morning. You know like…wake up and realize we’re alive with yet another opportunity to enjoy our gift of Life by being the best “me” possible…that kind of happy! “Some days are diamonds and some days are stones”…we’ve all heard this one, right? Well, it’s true; however, there’s only one way to look through a half-empty glass: with determination, backed by a heart that refuses to quit. That’s it. Period. If you’ve read my book, you know what I’m talking about…blaming someone else…throwing up our hands, running from the situation, hiding under a bed, in a closet…getting someone else to fix it for us…whatever, is not an option – EVER – and If you haven’t read my book, just trust me when I say that in 90% of the situations in our lives, refusing to face the situation/running from the problem will never solve the problem…and that other 10%, well, I doubt running will help there either. Being miserable is a choice, just as is being happy. Oh, we can justify our state of mind with blaming anything or anybody for our misery, but it’s just that…blame…and if one’s not careful, wallowing in that misery can become a way of life. It’s true, I’ve seen it and it’s not a pretty site. The blame game never gets us very far and at some point we must shut-up, put-up and face the situation head-on. Miserable and Happy are not suitable partners. It will never work out together because Misery loves Company and Happy loves Life. So, are you happy? I sure hope so! If you’re not, then just be honest with yourself and the issue. If you aren’t happy and you know it, you cannot “clap your hands”, however, you can hide your face in your hands and stay in your misery. 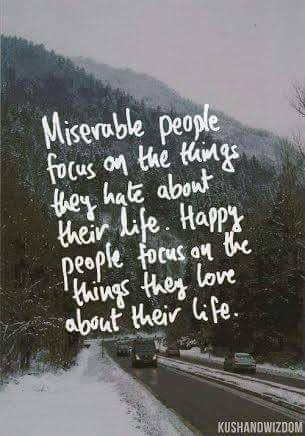 The other side of miserable is HAPPY. We can ALL be happy if we truly want to be. We have been given this incredible Free Will…let’s use it to be happy! This week my prayer for us all is that we will go to the Lord in prayer and ask for His mighty Hand to touch us and fill us with His holy spirit, that we’ll have the courage to face our misery as we seek a better life in a state of happiness, in His holy name. Amen! This entry was posted in Uncategorized on August 20, 2018 by Author Margaret McBride. Hello Everyone and welcome to my Monday Blog! Hope you had a glorious weekend filled with sweet Joy and opportunities for even more Joy!! This weekend I promised myself I was going to catch up on all my unfinished book business here in the office, since this summer has been filled with travel – both business and pleasure. When I finally was getting settled back in, I realized there was more to be done than I had expected. As I was going through my files, searching through all my Blogs for one specific post, turned out, I went all the way back to my very first Blog on January 14, 2014. By now, many of you who follow me here, know a bit about my novel and my inspiration for writing it; however, as I’m sitting here now, I feel led to repost it for any of you who don’t know, but would like to know me a little better – matter of fact, I’d sure like to know you better as well! One of the happiest moments in life is when we find the courage to let go of what we can’t change – This courage comes in many forms…and forgiveness is one of them. Welcome to my Monday Blog! 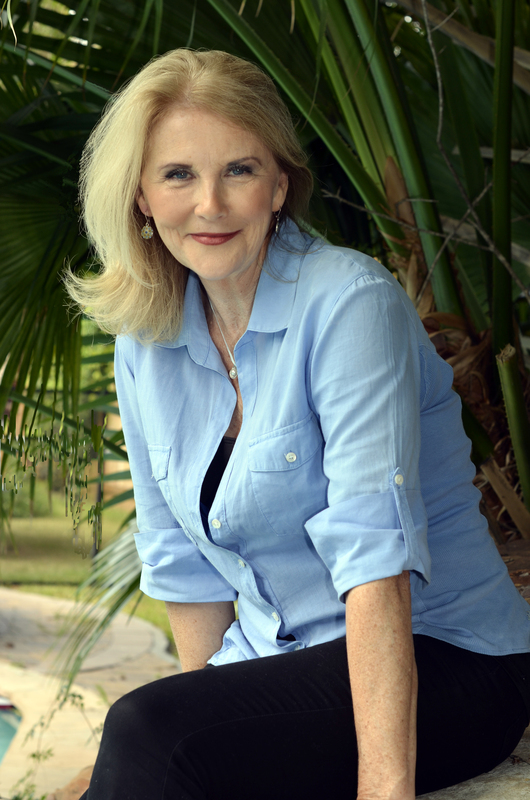 I’m Margaret McBride, author of “That Melvin Bray”, loving sister, aunt, wife, mother, grandmother and resident of the wonderful state of Georgia. My husband Dan and I live in a small vibrant community just outside of Atlanta. I’m going to begin my blogging adventure by telling you my inspiration for writing my book. Four years ago I was sick as dog and just simply could not get well. I’d been in bed for several weeks and finally actually became depressed. One of my darling nieces thought a “good book” would help me, so she sent me a copy of a little book titled “The Shack”. Well, I began reading it and within a couple of days I was feeling better. A few days later I felt like a new person—key word there, “new”. In case you haven’t read “The Shack”, it’s all about loss and forgiveness. I’d been living the life of a Christian since I was eleven years old—quite a long time, since I had just turned sixty-two while sick. However, until I got sick and read that little book, I was unable to admit to myself that I was not only physically sick, but suffering spiritually as well. A sick soul is a sad soul, believe me. As I began to get in touch with my heart, I also continued my physical recovery. Then I began writing a personal journal asking myself what was really wrong with me. That’s when I realized that I’d been carrying around this huge grudge against my father, an abusive alcoholic. For many years, my Mother, my siblings and I lived the kind of life no one wants to talk about. There were bundles of love and joy between Mother and us kids, however, my father was a terrifying experience to endure. As a result of “The Shack”, I was able to finally get in touch with myself, heart and mind working together, to uncover the secret I had hidden so long ago and so deeply in my heart—the fact that I had never forgiven my father. Honestly, I don’t think I was ever even aware of this fact. My heart is abundantly lighter now, because I have forgiven my father…I know it and God knows it. How do I know, you ask? Well, now when I think of my daddy, I will imagine a time when he was NOT full of alcohol and anger…yes, there were only a few of those times, but enough to hold onto, and then I feel a smile spreading across my face. That’s how I know I have finally forgiven my father. This entry was posted in Uncategorized on August 13, 2018 by Author Margaret McBride. Welcome, my Friends, it’s Monday Blog time! Thank you for sharing your time with me today and I love your comments, so feel free to leave one, anytime! Ever feel like the lone ranger…third wheel, weird-o, odd man out, goofy, strange bird?…you know where I’m headed with this – well, it’s ok to be different! Matter of fact, I do my best to be different. I kinda like standing out in a crowd. It’s times like that when I can be filled with pure JOY because I’m humbled at the opportunity to be a light to anyone who may need it. I’m only too eager to share that Joy! Believe me, there are some days though, I have many reasons to stay in bed, but I’ve learned that I have so many more reasons not to. It’s a pretty awesome feeling when we get up, get going and just smile at someone. We’re not just helping them, we’re treating ourselves to a gift at the same time. God blesses us when we please Him. When we engage in helping others, especially those who truly may feel like the odd ball, God is pleased with us. Every day is a new day and another opportunity to do ourselves good. In order to help others, truly, we must care about ourselves first. That’s a good thing, a healthy thing and very necessary! Self-love is very important. Once we love an honor ourselves, as Jesus Christ does, we are then able to reach out to others in need. Especially those who truly feel left out, estranged, lonely…and maybe even have never learned to love themselves. That is sad. Ya know, Life builds and breaks everyone in different ways. It’s how we cope with our challenges that determine how we see the proverbial glass – Half full, half empty? Yep, it’s perfectly OK to be “different”…it’s not OK to be estranged and lonely because one feels he/she is the kind of “different” that is unlovable. My prayer for us all this week is that we will nurture the love inside ourselves and in doing so, ask God to help us to be more aware of those around us who may be sad and lonely and in need of love. Where would we all be without the love of Jesus? That is sad. This entry was posted in Uncategorized on August 7, 2018 by Author Margaret McBride. Welcome to my Monday Blog, my friends! Thank You for sharing some time with me today and I hope you’ll will be blessed in some way that puts a smile in your heart! “Oh, sorry, Mom. Yes, I heard you. It’s been so long since I thought of him. I’m sorry, but I honestly thought he died years ago,” Jack said. “Well, he didn’t forget you. Every time I saw him he’d ask how you were doing. He’d reminisce about the many days you spent over ‘his side of the fence’ as he put it,” Mom told him. “I loved that old house he lived in,” Jack said. “You know, Jack, after your father died, Mr. Belser stepped in to make sure you had a man’s influence in your life,” she said. “He’s the one who taught me carpentry,” he said. “I wouldn’t be in this business if it weren’t for him. He spent a lot of time teaching me things he thought were important. Mom, I’ll be there for the funeral,” Jack said. As busy as he was, he kept his word. Jack caught the next flight to his hometown. Mr. Belser’s funeral was small and uneventful. He had no children of his own, and most of his relatives had passed away. The night before he had to return home, Jack and his Mom stopped by to see the old house next door one more time. Standing in the doorway, Jack paused for a moment. It was like crossing over into another dimension, a leap through space and time. The house was exactly as he remembered. “What’s wrong, Jack?” his Mom asked. “The box is gone,” he said. “There was a small gold box that he kept locked on top of his desk. I must have asked him a thousand times what was inside. All he’d ever tell me was ‘the thing I value most,'” Jack said. “Now I’ll never know what was so valuable to him,” Jack said. It had been about two weeks since Mr. Belser died. Returning home from work one day Jack discovered a note in his mailbox. “Signature required on a package. No one at home. Please stop by the main post office within the next three days,” the note read. Early the next day Jack went to the post office and retrieved the package. The small box was old and looked like it had been mailed a hundred years ago. The handwriting was difficult to read, but the return address caught his attention. “Mr. Harold Belser” it read. Jack took the box out to his car and ripped open the package. There inside was the gold box and an envelope. Jack’s hands shook as he read the note inside. “Upon my death, please forward this box and its contents to Jack Bennett. It’s the thing I valued most in my life.” A small key was taped to the letter. His heart racing, as tears filled his eyes, Jack carefully unlocked the box. There inside he found a beautiful gold pocket watch. Jack held the watch for a few minutes, then called his office and cleared his appointments for the next two days. “Why?” Janet, his assistant asked. We may not realize it, but it’s 100 percent true. 1. At least 15 people in this world love you in some way. 2. A smile from you can bring happiness to anyone, even if they don’t like you. 3. Every night, SOMEONE thinks about you before they go to sleep. 4. You mean the world to someone. 5. If not for you, someone may not be living. 6. You are special and unique. 7. Have trust sooner or later you will get what you wish for or something better. 8. When you make the biggest mistake ever, something good can still come from it. 9. When you think the world has turned its back on you, take a hard look: you most likely turned your back on the world and the people who love and care for you. 10. Someone that you don’t even know exists loves you. 12. Always tell someone how you feel about them; you will feel much better when they know and you’ll both be happy. 13. If you have a great friend, take the time to let them know that they are great. My prayer for us all this week is that we’ll consider what our time may truly mean to someone else. We just never know the impact we might have on someone, anyone, who is in need…of nothing more than a few minutes, a kind word, a thoughtful action. Amen! * Note: A very special “Thank You” to a FB friend for sharing this “Letter” with me today so I could share it with all of You! This entry was posted in Uncategorized on August 1, 2018 by Author Margaret McBride.